Tong L. Steinle, a Chinese paper-cutting artist, taught herself how to paper-cut at a young age. 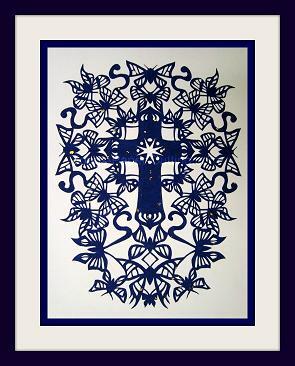 Butterfly-cross paper cutting art is one of her specially created cross art work. She was an architecture designer in Qingdao. Over 10 years in Architectural Design, finished almost 100 different buildings’ designs (including residential buildings, office buildings, hospital patient building, Mall buildings, high rise buildings, underground building, school building, total about 280,600 sq.meters. The First Prize of 2002 Excellent Reconnaissance Design of Shandong Province. She was born and grew up in Qingdao, China. Because she grew up at the Cultural Revolution in China (1966-1976), and her name Tong (彤) means Red, because everybody should be Red. At that time there were not many available toys for girls. Her father gave her a pair of scissors and some old newspaper, and showed her how to make snowflake cuttings. After that, she never stopped cutting paper. When she was in the middle school, she had a cutting pal, and learned the patterns paper cutting. In the high school, she decorated the whole classroom with hundreds snowflake cuttings for the New Year’s Party. After 2001, she came with her first husband and daughter to USA. She had her first paper cutting display in Broadmoor Library in Shreveport, LA. at 2004. After her first husband was killed in a car wreck at early 2006, Meadows Museum of Art in Shreveport helped her to exhibit her paper cutting art work for two months. She created beautiful Butterfly-Cross paper cuttings in her difficult time in 2006. Butterfly-cross paper cuttings became one of her special art works. The cross is made of creative butterflies. Can only make one cross at a time, none are the same; they are unique and gorgeous, graceful and elegant. She Married David Steinle, and moved to Texas. Through the years, her paper cutting has expanded to many different styles. Not only does she do Chinese paper-cutting, but she customizes other pictures into unique paper-cuttings! She had many displays in Amarillo Panhandle Art Center. She started her Tong’s Paper Cutting in 2007, and built her own Tong's Paper Cutting website at 2011. There are a lots of free paper cutting patterns for everyone in the website. Now it changed to Tong’s Art Studio at 2013. 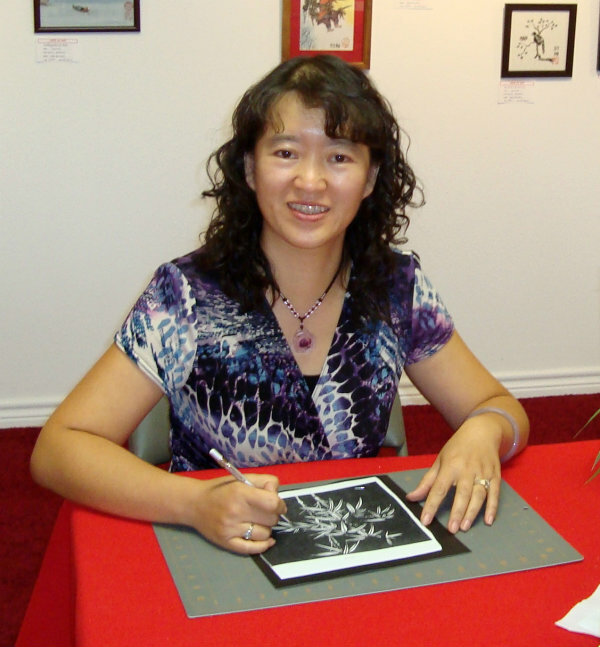 She joined John Eder, Chinese brush painting artist, and displayed her art work in China Art Gallery at Amarillo, Texas, June 2013. She opened her own Tong's Art Studio (李彤纸艺) and Gallery in Sunset Art Galleries in Amarillo, Texas, September 2014. She displays and teaches paper cutting in her studio. Her online shop Tong's Art Studio, you will find her original art work, paper cutting templates, origami, and all kind paper art jewelries. Tong's Art Studio Facebook Fun Page to get the newest updates for her art works and events. Join her Paper Art Lovers Group to ask questions about paper cutting, and share your new cuttings.